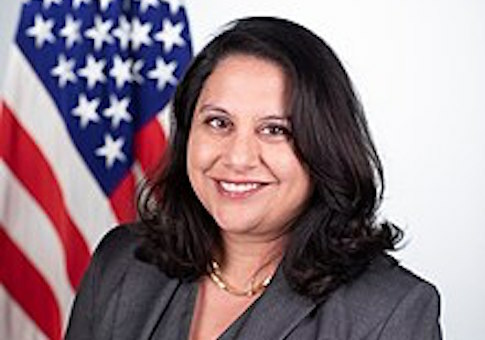 President Donald Trump announced Tuesday that he has nominated current administration "Regulatory Czar" Neomi Rao to fill Brett Kavanaugh's former seat on the D.C. Circuit Court of Appeals. Trump's announcement came during the White House's celebration of Diwali, the Hindu festival of light (Rao, who is Indian-American, was present at the event.) According to reports from the event, Trump said that he had intended to make the announcement on Wednesday, but "seemed delighted to do it in person." Trump first interviewed Rao for the position in late October, according to Axios. As the Washington Free Beacon reported last week, the Department of Justice actively began vetting her last Friday. Rao, 45, is currently the administrator of the Office of Information and Regulatory Affairs, the organ of the executive branch responsible for overseeing all major regulations made by the other departments. From that position, Rao told the Free Beacon in an interview in May, she cut some $8 billion worth of regulations in 2017 alone. Prior to joining OIRA, Rao was a professor at George Mason University's Atonin Scalia Law School, where she developed her pedigree as an expert in administrative law by founding and directing the school's Center for the Study of the Administrative State. She also previously clerked for Supreme Court Justice Clarence Thomas, an indicator of her conservative bona fides. Rao's nomination will now go before the Senate Judiciary Committee where, an administration official familiar with the process told the Free Beacon last week, a hearing is expected some time in mid-December. If all goes to plan, Rao will likely be confirmed by the full Senate in the new year. If she passes through this gauntlet, Rao will take a seat on the D.C. Federal Circuit Court of Appeals. Sometimes referred to as the nation's second-highest court, the D.C. circuit routinely deals with major cases challenging the federal government. It is also often seen as a feeder for Supreme Court Justices: if confirmed, Rao will succeed to the seat previously held by now-Justice Brett Kavanaugh.